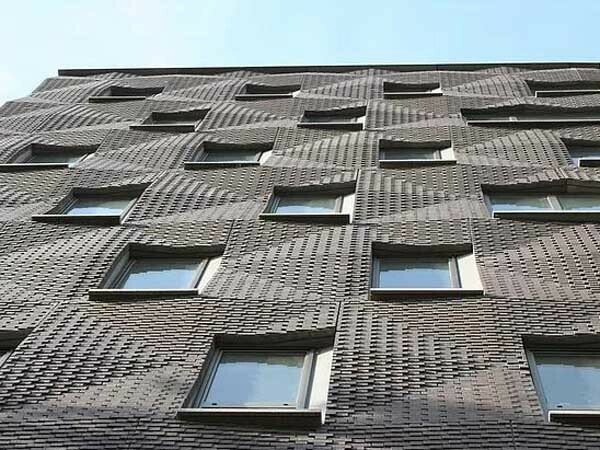 A beautiful three-dimensional brick inlay façade on an apartment building in New York City is drawing attention from passers-by for its striking appearance. Located in the NoLita district (North of Little Italy) in New York City, the Mulberry House is a 13-storey mixed use building with commercial space on the ground floor and cellar, and nine residential units above. The eye-catching façade of Mulberry House was created by AP Formliners, a leading manufacturer of architectural formliners. The building’s location, right across the street from the historic Puck Building, known for its decorative brickwork, as well as contextual zoning regulations requiring a ‘predominantly masonry’ façade, led to the design objective to contemporise this ancient brick inlay technique. The rippled brick façade treatment acknowledges the use of brick panelling, and complements the neighbourhood's highly articulated historic brick façade. The Mulberry House was designed by Shop Architects. AP Formliners produces brick inlay formliners exclusively for Robertson Facade Systems in Australia.